Working together inevitably involves compromise. But is compromise always less than the best? Finding the “best” in any situation involves many comparisons, trade-offs, and compromises. Sometimes when trying to find the best solution to a design problem even the most experienced and well focussed individual will alight on something that is better than all the other, similar solutions, but is substantially worse than the very best result. An applied mathematician or engineer might say that the current solution is suboptimal. To find the very best you sometimes have to shake things up a bit; explore beyond the current solution. The computational processes that abet this strategy are often referred to as “stochastic.” They require randomness, i.e. noise, in order to improve on initial approximations. Paradoxically, the introduction of randomness, increasing the entropy or adding noise, can bring a computational process to a more satisfactory, and even accurate, conclusion. Pounding a heated bar of metal with a mallet increases a metal’s strength by a similar process. The heat raises the entropy of the sample so that it will be stronger on subsequent cooling and as its molecules order themselves into a more stable and robust configuration. There are further examples where the controlled introduction of impurity improves some material process. Think of the development of a vaccination to improve resistance to disease. The development of immunity within communities seems to require the exposure of human populations to “safe” levels of microorganisms, the controlled introduction of organic noise. The deployment of noise, even to shift a computational process into a new state, is a subtle process. Too much noise and the process flies off into an unstable condition in which nothing is resolved or it kills off possibilities. A little randomness, judiciously applied, can tip the process into a usefully new condition. Think of this requirement for entropy as providing space to move. Entropy and its accommodation involve flexibility. Any structure needs to accommodate looseness. Rigid structures tend to be brittle; they fail catastrophically. Bridges have to move a little in response to the vibration of the traffic, the wind, and seismic vibrations. Structures don’t only need to be specified and built with accuracy, but also with an accurate assessment of tolerances, of where and how elements can move in relation to each other. The variability that is noise can require precision — the introduction of precisely controlled randomness, or the precise accommodation of random variation. Entropy has a social dimension. Elsewhere I’ve mentioned how the composer and architect Iannis Xenakis developed an approach to musical composition that harnessed the power of “stochastic laws,” which he explained in terms of a crowd’s violent protest. See post: Transilience. We readily associate noise with the behaviour of the crowd, which in Xenakis’ account is seen to exhibit structure and movement. Communications between people are inevitably and desirably noisy. It is tempting to think that any group of people working together on a project needs to share common terms, and agree precisely on what to accomplish and how to go about it. But if groups had to settle on a common vocabulary before they could communicate, little would get done. People working together commonly just get on with the task and leave the definitions to emerge in the course of their interactions. The one group member who insists on being precise about terms, definitions, and objectives before starting work is usually sidelined. But groups do not only accommodate flexibility in order to avoid arguments; flexibility is how things get done in any case. Meanings emerge by virtue of the context of the task. Rigid definitions inhibit the opportunity for meaning by suppressing the context, the task at hand, and the complex social relations of the group. In this sense noise is essential for the functioning of the group and the creation of meaning. Noise can also be introduced into the group as a tactic. A rigidified community or meeting can be enlivened by the introduction of a person or theme that creates a condition of ambiguity, incongruity, and anomaly — noise. The new entity ambiguates a situation in which everything is otherwise taken as clear-cut. Prejudices are challenged, new aspects of the task are brought to light, and new questions are opened up. This process may be enlivening or frustrating. It may be just what the task calls for or it could debilitate. Noise can enable and disable, reveal and conceal, clarify and occlude. In any event, noise contributes a major component in the arsenal of communication, interaction, and tasking, to be tweaked and tuned by the group. I think that devices can have this disruptive function as well. Smartphones contribute to the noise of human sociability in more ways than one. The audio signals they transmit occasionally succumb to noise and interference. Mobile devices contribute unregulated, extraneous, and often bothersome noise to the ambient environment. But such devices also present as alien and incongruous entities that challenge categories and render social interactions and social relations ambiguous. Lest people become inured to their unusual character, it’s worth noting that mobile devices are also carriers of change. Electronic devices currently exhibit multiple and amorphous functionality. My possession of any single mass-produced device involves participation in a sequence of devices, an ever-developing product line, new releases, versions, and improved models. In this sense electronic devices are conveyors of incessant renewal and change. As smartphones and programmable computers, they are also media for delivering a regular stream of newness. Just when societies think they have come to terms with the cell phone, adjusting their schemas and ontologies to fit, they find that the objects in their hands are not only phones but also interlinked locational devices, with maps. Then I download a third-party application that further transforms the device into a phrasebook, a game console, a means of dispatching photographs to a web-based photo display service, a planetarium, a seismometer, or a means of monitoring and controlling the temperature in my home. Now we encounter the smartphone as a means of delivering 360 degree videos and 3D “virtual reality” environments — even made out of cardboard — further altering our relationship with the world of the senses. The phone slots into a viewfinder with lenses. There are Youtube and other sites that display 360 degree videos. See the BBC 360 site. Participation in this newness—as consumers, users, critics, developers, investors, publishers and designers—keeps the incongruity alive, refreshes the noise potential of the device, sustains entropy in the marketplace, and animates co-design. This blog is adapted (and updated) from Coyne, Richard. 2010. The Tuning of Place: Sociable Spaces and Pervasive Digital Media. Cambridge, MA: MIT Press. Here I’ve avoided the technical discussion of multi-criteria optimisation, Pareto optimality, constraint satisfaction, and satisficing, to which there is a long history. I have though used some of the vocabulary of design as problem solving: i.e. the idea of a solution. 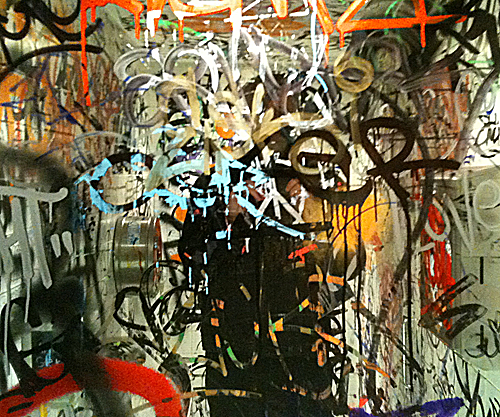 The first image is in the bathroom of an art exhibition on graffiti. The second image shows a Google cardboard VR assembly.